If being charged £13.70 for a ridiculously flat pint of Heineken and a large glass of white wine by a stuck up barman is your bag then I'd go there. Otherwise avoid. My wife and I just made an attempt at having Sunday lunch at the Coat and Badge in Putney. We had to give up and ask for a refund it was such a frustrating and unenjoyable experience. Our general observations were that no-one seemed to be in charge, it looked like there was total confusion behind the bar and the staff all seemed to get involved in or consult each other over every order. Firstly we asked for a slight variation on the Sunday roast menu (which only had three things on it) and the bar girl had to consult three people before going back into the kitchen to confirm that 'no' we couldn't change the menu. So we ordered two coffees to come straight away with a bread basket and then two Sunday roasts – just over £40. Not a complicated order. After a long wait, I had to go up to find out what was happening with our coffees only to find that someone had started making them and then forgotten about them as they were sitting under the coffee machine. When we got them they were half full. After a further wait, I then had to go up again to find out what was happening with the bread basket. The waiter asked who took our order, raised his eyes when I told him, checked the computer and said that we could have someone else’s – handing me a bread basket. The bread was hard in places. After over an hour the Sunday roasts arrived. Whilst the Yorkshire pudding was hot, my roast beef and my wife’s chicken was cold. The vegetables still had not arrived. By this point we were totally fed up and I asked to speak to the manager. Our waitress, Jen, told me that she was the manager. I explained that we had had a dreadful experience and wanted a refund. She went off and came back with £30 explaining that she would refund us for the roasts and didn’t offer any apology. I said that I felt she should refund us the entire bill emphasising the fact that this is not an experience that I felt I should pay for. She disappeared and came back, pushed ten pounds in my hand and stormed off without saying anything. My wife then spoke to another member of staff who said she was actually the manager. My wife’s main point was that the waitress’s behaviour was unacceptable. The “manager” shrugged her shoulders, claimed she knew nothing about it and finally offered a belated apology; at which point we left. Came in last night after football and was surprised to see that they only had 1 real ale available across their 3 hand pumps…this was their own beer brewed for them by Wells & Young, it was pretty decent but smelt like it was slightly on the turn. My 2nd visit here the last one being about 7 years ago. 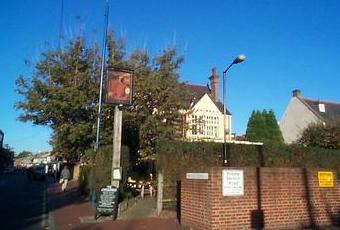 It’s a lovely looking pub with a large area to the front with heaters and lots of tables and chairs. Inside there is a large quantity of rowing memorabilia on the walls but this place is a bit too pouncy for me. A quick pint and it was time to move on. I totally agree with papamike , the Jolly Gardeners is a much better pub. I must be missing something. Best pub in Putney.. not likely. Walk past this one and head to the Jolly Gardeners about 2 mins down the road. One of the best pubs in Putney, although perhaps a bit overpriced on the food side. Attracts nice looking people, which is a good plus, but does mean that a table outside on a summer evening can be difficult to find!